The rains have arrived! We are experiencing cooler nights – hooray! Power outages seem to accompany the arrival of rainy season. The other night the boys were not going to let a power outage stop their nail biting game of Battleship. Jonah wore a headlamp so he could see where to place his pegs and Joshua relied on candlelight. This entry was posted in Cameroon, home, Kids and tagged Battleship, Cameroon, Home, Kids. Bookmark the permalink. 3 Responses to You sunk my what? I never cease to be amazed at your resourcefulness. Electricity or not – there is still a way to play battleship! By the way, who won? 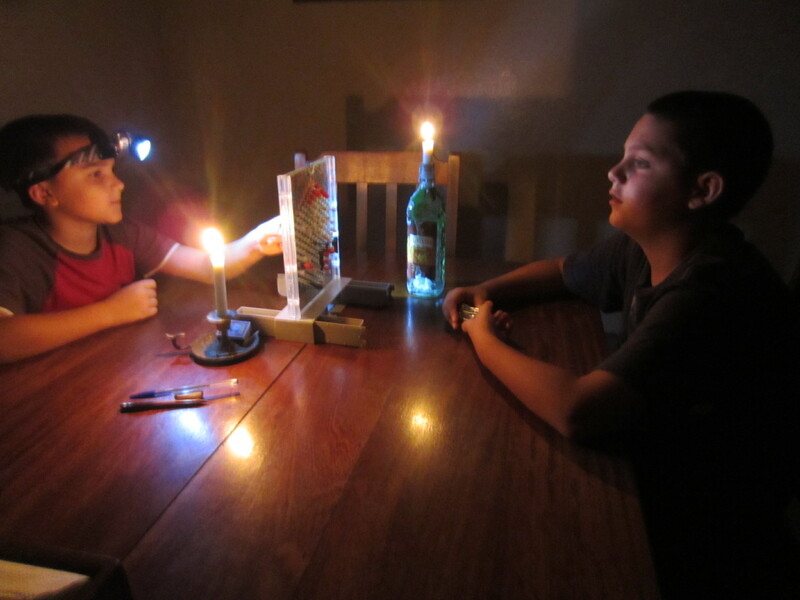 Well – Just because the power goes out doesn’t mean the boys stop arguing. Jonah got frustrated because Joshua had sunk all but his last boat, so I took over. I ended up winning.